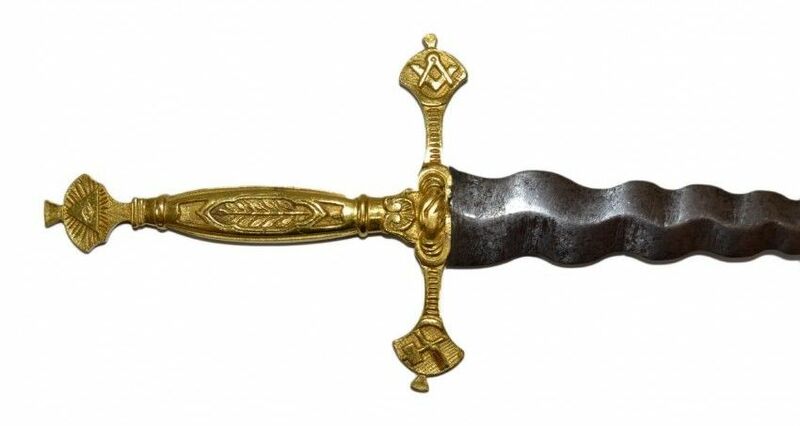 Features: A Masonic dagger with gilt brass hilt depicting various Masonic symbols. Made without a scabbard as it was dictated that the flame could not be contained. Very sharp steel blade with file marks visible in the troughs. History: The flame-bladed sword has a wavy zigzag blade; the intention of this unusual shape is to represent fire when moving. This sword is considered to be an entire symbol surrounded by esoteric and mysterious legends.It is an item which is related to the Masonic movement in which the flame-bladed sword is known for being one of the symbolic elements of Freemasonry, along with the compass that represents geometry, the square that represents both intellectual and moral honesty, and the grenade that is identified with ideas of achievement. In general terms, Freemasonry is a secret society which is distinctly philosophical, symbolic and religious in nature, the origins of date back to the Middle Ages with the development of several professional organisations of artisans. The name Freemasonry itself derives from the French terms franc-mason meaning free mason. It was through this that these artisans of stone, metal and wood decided to form their own groups to defend their interests against the grievances of the the wealthy. To communicate they started to use secret signs the meaning of which was known only by them. They took their own symbols such as those listed above; along with the flame-bladed sword with a winding blade they also used a straight sword.Little by little these organisations of artisans started to be tainted with occultism and mysticism thanks to the work of alchemists and philosophers, thereby losing their original meaning. Furthermore, their branches extended into other social groups such as thinkers, nobles, soldiers and beyond, and by the 19th and 20th centuries economists and politicians. Their utmost aspiration was to built a spiritual community based on virtue and science.Reverting to the idea of the flame-bladed sword as a central symbolic element of Freemasonry, it is worth highlighting that it could only be used by the Venerable Master of the Lodge and in any case, also by the watchmen and brothers who guarded the temple, the Temple Guardians. When the flame-bladed sword is in the hands of the Venerable Master in Masonic ceremonies, it acquires the meaning of spiritual power and a source from which all science emanates. It is the Venerable Master who is in charge of radiating the light that is emitted by the blade of the sword with its zigzag reflections over all the members of the order. This light which is emitted by the flame-bladed sword must reach all the corners of the world thereby spreading wisdom to oppose obscurantism and hypocrisy. On the other hand all the Temple Guardian brothers also carry the flame-bladed sword acting as a symbol of security, as they are the ones who must protect the security and discretion of the rest of the brothers of the Lodge when they meet.The flame-bladed sword is never sheathed, this is because the Masons believe that fire cannot be trapped and sheathed, and always remains free, for everyone to see, instructing and illuminating men. In addition the fact that the sword always appears naked, without a scabbard, contributes to reinforcing the meaning that virtue and science are universal assets within everyone's reach and in the hands of all of humanity. The idea of associating the flame-bladed sword with esoteric and mystical elements is reinforced by the fact that this sword is represented in the Tarot. The flame-bladed sword is on several of the major arcana such as the Wheel of Fortune card which represents the eternal. It also appears on the Justice card and on The Magician, representing alchemy and strongly related to Freemasonry.To conclude this overview summarising the meaning of the flame-bladed sword, one final reference should be added: the reference made to this sword in The Bible. More specifically, in one of the passages related to Adam and Eve written in Genesis (Gen, 3: 24). When both parties eat the apple from the forbidden tree, God punishes them by expelling them from Eden and condemning them to work the land. God proceeds to close the gates to Paradise with a flame-bladed sword or sword of fire, and places guardian cherubs on either side to prevent the first woman and the first man described in The Bible from reaching the Tree of Life that would give them eternal life.